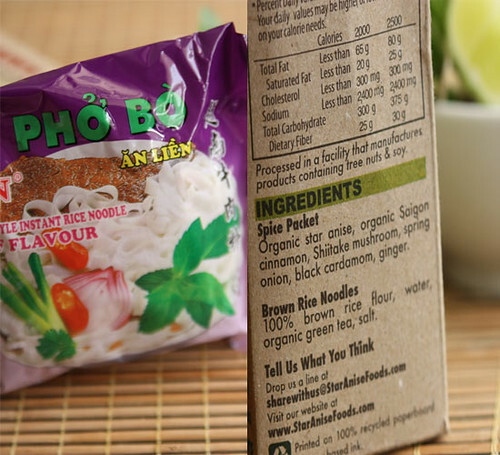 Happy Pho Gluten Free Brown Rice Pho Noodles and Giveaway! 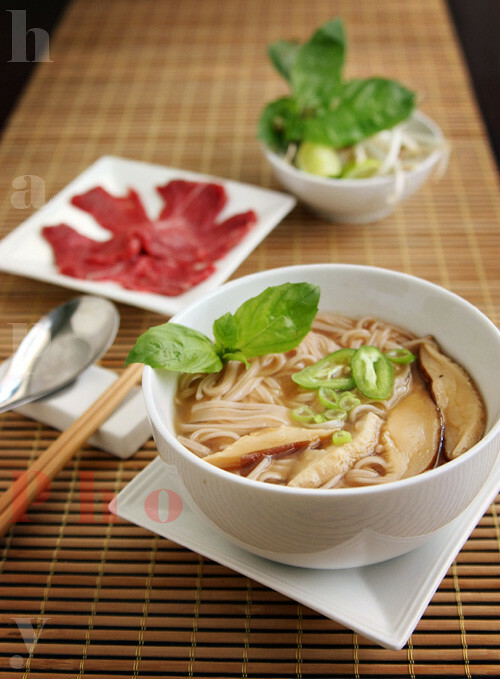 Have you noticed that with close to 100 recipes, we haven’t posted a single recipe for pho? We adore pho and love the fragrance that wakes us up in the morning from an overnight marriage of beef bones, charred ginger and onions, fennel, coriander, star anise, and cinnamon infused broth. But yet, we haven’t posted our recipe. While pho may be almost synonymous with Vietnamese food and considered the national dish, we started this blog with the intent of showcasing the awesome variety and deliciousness of Vietnamese food beyond pho. For the casual or even food savvy American that reads our blog, most know of pho and banh mi but likely not many more dishes beyond that. So our pho recipe will still have to wait as we have so many other great Vietnamese dishes to share. 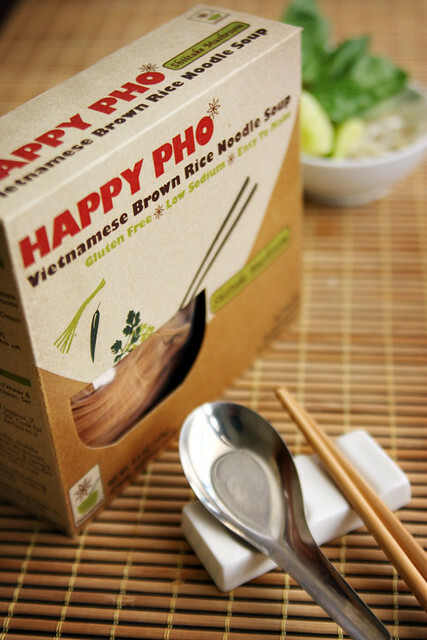 Here we present Happy Pho , a gluten free, brown rice instant noodle created by pho lovers Thao Nguyen and Karen Cheng from the San Francisco bay area and co-founders of Star Anise Foods. We received a package of shiitake mushroom pho to sample and recently made it for dinner. We typically eschew anything “instant,” when shopping for groceries, but Thao and Karen’s story intrigued us. Pho runs in the veins of Thao’s family since the days of her grandparents peddling pho on the streets of Nam Dinh, a city 1 hour south of Hanoi. Growing up eating this pho, Thao along with friend Karen, a life long lover of pho, began their mission to start a business based on their mutual love of pho and desire to create a quick yet nutritious instant version. In 2009, they packed their bags and left for Vietnam, eating, sleeping, and dreaming about pho and how they could recreate a version with wholesome ingredients. They encountered resistance and even outright rejection when they ask traditional pho noodle makers about making brown rice pho. But through their persistence, they developed Happy Pho. You can read more about it here. So what’s in this box made of recycled paper and soy ink? 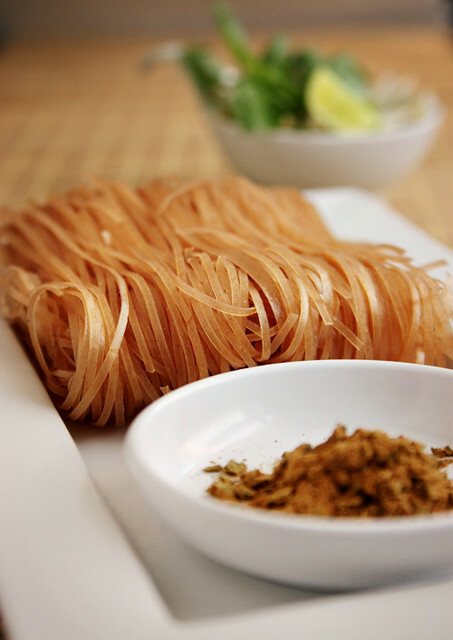 Brown rice noodles and a spice packet. On the surface, this is just like any other instant noodle found in the Asian markets. But in reality the rice noodles are from whole grain brown (more fiber and nutrients) and organic green tea. Who would have thought that goes in pho noodles? The spice packet is loaded with bits of dried green onions and shiitake mushrooms and is quite fragrant with star anise and cinnamon–clearly no white crystalline MSG in this product. Made just of organic star anise, organic Saigon cinnamon, spring onion, shiitake mushroom, black cardamon and ginger. Shall well compare this to a bag of Vifon instant pho we bought for the purposes of this post? 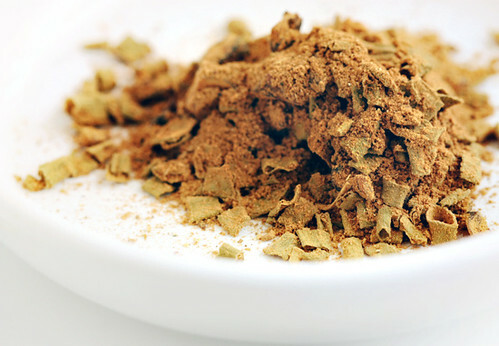 Spice ingredients: Salt, sugar, refined palm oil, MSG, disodium 5-guanylate, disodium 5-inosinate, textured wheat gluten, green onion, eryngiym, pho spices, artificial beef flavor, nature color, caramel. 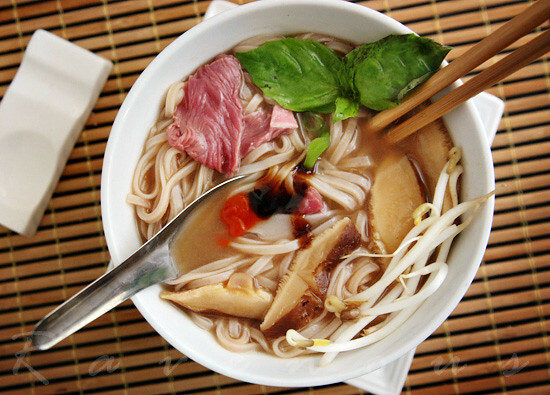 For a rundown on several varieties of instant pho, check out Loving pho site. Unlike other brands of instant noodles where you just pour in hot water and eat, Happy Pho does require and encourages you to “cook,” by seasoning the broth to your tastes and adding different ingredients such as tofu, mushroom, spinach, etc. Each box is a healthy serving for 2 adults. We made this according to instructions bringing 4 cups of water and spice to boil, then adding additional shiitake mushrooms, noodles, and simmering it till just soft. The instructions call for adding salt to taste–we added about 2 ts of salt and also about 1/2 ts of sugar. We had the usual accompaniments of bean sprouts, basil, thinly sliced beef for bo tai, and Sriracha and hoisin sauce. So the verdict? It was good! Something you can keep in the cupboard for a quick and easy meal. The size and texture of the brown rice noodles was good and spot on. Clearly healthier and better than the instant noodles/ramen that we used to eat in college. The spice packet is simply just the whole ground spices so you have the freedom to season to your taste. Does this broth have the beefy flavors of the restaurant or home made pho with overnight simmering of beef bones? Of course not–but it’s not meant to. The clean familiar fragrances of star anise and cinnamon is pronounced and makes for a satisfying bowl of noodles dressed with your favorite vegetables and/or meats. You can also use different canned chicken, beef, or vegetal broths as a base or an organic bouillion such as Rapunzels bouillon . This is not a paid endorsement and we only post about products we like and think our readers might be interested in. Happy Pho is sold on Amazon and in many markets in Northern California. Thao and Karen are generous to do a give away of all of their flavors including shiittake , garlic goodness , and zesty ginger for one lucky reader to try! 1. Like Star Anise Foods on Facebook and leave a seperate comment here saying you did so. 2. Like Ravenous Couple on Facebook and leave a seperate comment here saying you did so. 3. Subscribe to our blog either by email or RSS reader and leave a seperate comment saying you did so. Hi there, this sounds interesting I subscribed to your page. OK you guys, you are so cute on your facebook page. As far as subscribing I have been a loyal reader of your blog for a while. I was reading when you two got engaged and way before that. I drool over your pics and have made a few of the recipes and they have been great. I'm looking forward to trying the noodles, even if I don't win. But I took a chance and 'liked' both the noodles and you two on Facebook. I don't tweet so this will have to do. Wish me luck. I've definitely been a subscriber for a while now! Chow on! I love pho! I get take out from a restaurant maybe once every other week. But I've never seen the type in this post before, looks great! You were one of the first sites I subscribed to in my Google Reader. i also liked "Ravenous Couple" on Facebook. oh and also I tweeted about the giveaway …twice. I friended Ravenous Couples on Facebook. I friended Star Anise Foods on Facebook. I "like" Ravenous Couple via Facebook. I made a friend request on Facebook to Star Anise Foods. I follow and oh boy does this look yummy! Interesting. This would come in handy for when I'm sick and in need of comfort food like pho and can't get up the will or strength to cook it or drive to get some 😉 I "liked" their page on Facebook, btw. will it be available in the NW? The kids love pho, they already know how to make ramen noodles, this will be just as easy for them to do. I already like you guys on FB (how could you not?)! Tweeted the brown rice pho – great product. Love your posts, keep up the good food work! You Knew I Coming Over . . So Why Didn't You Cook? I'm an email subscriber to your blog! I'm still (patiently) hanging out for your bún bò Huế recipe! I liked ravenous couple on Facebook! Thank You! i've liked star anise foods on facebook! i've subscribed to you via google reader! +1 on facebook. I'm the 613th person woop! Hello from Texas! I'm thrilled to have found your site and am looking forward to reading your blog and enjoying the wonderful sounding recipes! I ADORE Pho…and I love instant noodles/rice noodles etc, but I am trying to reduce my instant noodles intake. Happy Pho seems to be a good, healthier alternative! I subscribed via the RSS reader on google. This blog is great for a foodie like myself. I liked Ravenous Couple on Facebook. I liked Star Anise Foods on Facebook. And, finally, done! So glad I found sssite. I'm really wanting to try Happy Pho but I haven't gotten around to trying to find it in stores yet. Love pages like yours. Also, I love pho! I like ravenous couple on facebook! I hope I win. and good luck to everyone!! Keep on cooking, blogging, and sharing! I love it!! I have liked Ravenous Couple on fb for a while now!! Who could say no to pho?? This is pretty interesting. I would love to see of more of your posts! Subscribe! Really excited to try this! LOVE your blog! Rice noodle have to cook to reconstitute it, so that it make your product not convenient. I thínk you need ro improve this issue and your product is better.